Soul Cakes by Fran W.
As a Halloween custom in Scotland and Ireland, children would disguise themselves in costumes and go door to door for food and coin. This tradition was called ‘guising’! During the middle ages, Soul Cakes were given out to ‘soulers’ as they went from door to door on Hallowmas (the night before All Souls Day) singing and saying prayers for the dead. This tradition is believed to be the origins of trick or treating! Stir confectioners sugar into a bowl of melted butter until smooth and creamy, then stir in egg yolks until that mixture becomes smooth. Add flour, spices, and raisins to the mix, and then slowly add enough milk to make a soft, yet formable dough. Tip: Mixing can be done with a mixing spoon at first, but the dough will form better with hands. When the dough is soft yet formable, pull off pieces and shape them into round, flat cookies about 2″ wide and 1/2″ thick and arrange them 1 inch apart on a greased cookie sheet. *Decorations can be “carved” into the cookies with a butter knife. Bake in a 350 degree oven for 10 – 15 minutes or until light golden brown. This recipe makes 10-12 cookies depending how how big you make them. 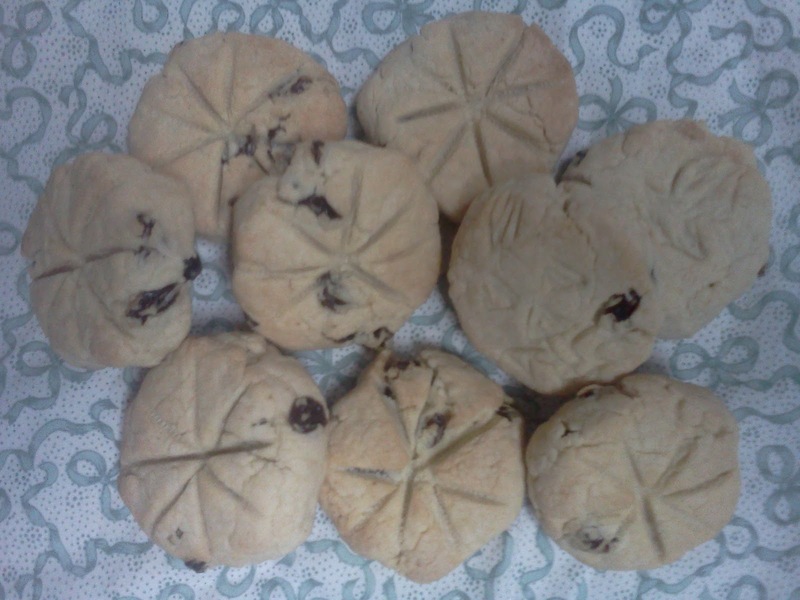 Note: Soul Cakes were originally marked with a cross to show that they were alms. *Tip: To decorate the Soul Cakes, cookie stamps may be used instead of a butter knife. When did ‘guising’ or costume wearing become a Halloween tradition in North America? Longer article about the history of Halloween. Disney helped popularized trick-or-treating when they released their 8:15 minute cartoon, “Trick or Treat” in 1952.